Ophelia Dances 22:10 19,20 kr. Symphony, No. 3 23:31 19,20 kr. The idea of building great music from modest or fragmentary means has characterized the work of Nordic composers for generations. In Svend Hvidtfelt Nielsen’s music, that idea finds a particularly exquisite and absolutely contemporary expression. It is an expression clearly influenced by the activities of Hvidtfelt Nielsen’s closest Danish colleagues and teachers. It bears the fingerprints of a working, performing musician. It builds on the structural honesty and openness of classic Danish functionalism, weaving unassuming fragments into majestic yet palpable wholes and imbuing them with imagination and fantasy in the process. Hvidtfelt Nielsen was born in 1958. He trained as an organist and studied philosophy and musicology at the University of Copenhagen. During his composition studies at the conservatories in the Danish capital and in Aarhus, his teachers included Yngve Jan Trede, Ib Nørholm, Hans Abrahamsen, Per Nørgård, and Karl Aage Rasmussen. Hvidtfelt Nielsen has always been interested in creating active polyphonic structures from which clear elements and procedural threads can be discerned. From the 1990s, the rhythmic and textural weave of his works underwent a process of refinement that only clarified the music’s workings further. His technique was sharpened courtesy of Per Nørgård, his textures distilled by the white purity of Hans Abrahamsen. Certain ideas about musical character and opposition sprang from the cartoon brilliance of Pelle Gudmundsen-Holmgreen. Hvidtfelt Nielsen combined these vital influences with his own interest in flipping background and foreground (often achieved by the coalescence of elements that initially appear to exist on different planes, downstage and upstage) and the combination of fantasy and focus that comes naturally to a musician familiar with improvising at the organ bench. From a formative piece such as Flowerfall (1993), it’s easy to trace a straight line to the more recent Symphony No. 3 (2010): each grasps its constellation of bustling materials with conviction, holding them in the air, marshalling them towards a clear end-point with skill. Svend Hvidtfelt Nielsen remains a working church organist and plays the solo part on this recording of his organ concerto featuring the Aarhus Symphony Orchestra, which commissioned the piece. The score is modelled on the organ works of the composer’s Danish predecessors Dietrich Buxtehude and Carl Nielsen. Specifically, in the case of Nielsen, it takes its lead from the organ monolithCommotio. In the simplest terms, that might be taken to describe its opening: a Big Bang from which the music immediately fragments before beginning the process of assembling itself once again. As those elements start to figure out ways of reassembling themselves (initially by means of a fugue), we get the impression of separate threads of yarn emerging from a loom. The organ gives us pinpoint delicacy, elegiac hymnody and thunderous roaring, but woodwind glissandos tease its mechanic specificity. Sometimes the music glances towards the filmic chase-down of Poulenc’s organ concerto; at others, it appears to take airy calligraphy and compress it into thickets of frantic activity, like a fragment of Bent Sørensen’s music viewed from the wrong end of a telescope. We hear the traditional action and reaction of a concerto, as when the organ lures the orchestra into compliance with an improvisatory chorale (from 09’00) only to turn on it with the savage material of the work’s opening. From the windy emptiness that follows that pivotal episode, the music’s weave begins to form again with new resolve – the polyphonic threads repairing themselves after the disintegration of the fugue. The organ rediscovers its ecclesiastical poise, clawing itself upwards in imitation of the entire work’s journey from low registers to high ones. What feels like accompanying figuration in the orchestra soon coalesces with the organ’s new resolve and becomes actual, usable material. Redemption is inevitable. 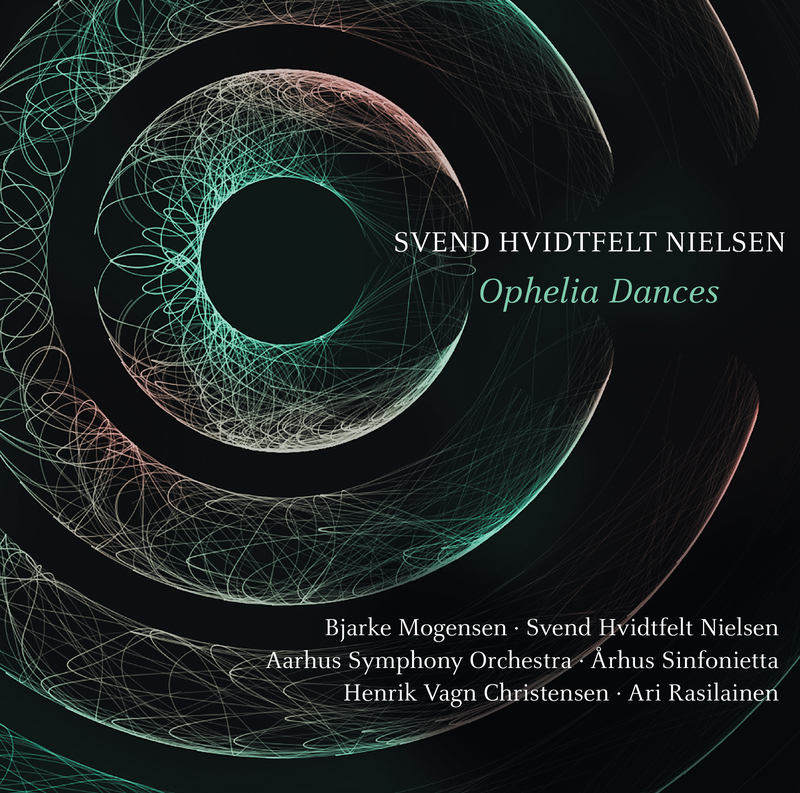 In Ophelia Dances, an accordion concerto written for Bjarke Mogensen and the Århus Sinfonietta, Hvidtfelt Nielsen claims to ‘hear the dancing’ of the fragile character from Shakespeare’s Hamlet. We, as listeners, hear more of the cleared white space that characterized earlier music from the composer. That, with the refined instrumentation of the piece and the fragility of Ophelia herself, underlines the clarity and delicacy of the part writing and the composer is able to explore minimal, focused ideas in each movement (even if four of them happen to be played at once). This is music best heard from the inside and scored accordingly. If there are human influences at work here other than Shakespeare’s, the first is surely that of the maverick Danish composer of the generation before Hvidtfelt Nielsen, Pelle Gudmundsen-Holmgreen. After the first dance (Calma con trasparenza) lays its cards on the table in a similar manner to the companion works on this recording, the drooping dance that ensues seems to want to reconcile two incompatible elements – a hallmark of Gudmundsen-Holmgreen’s work and a refraction of Hvidtfelt Nielsen’s fascination with musical coalescence. To greater or lesser degrees that binary opposition holds for the course of the concerto, whether finding its home on the traditional pitting of soloist with ensemble or in purely motivic terms. In the half-sounds of Tranquillo e tenuto, we could hear Ophelia already underwater; the string and wind exhalations submerged underneath the world of the glass chimes up above. The mobility of the accordion is the anchor in Più mosso, ritmico e elegante, in which the solo instrument is obsessively fixated on and around a single note, but eventually has to settle for the note an octave below it. The very Nordic idea of compartmentalized patterning contributing to the swirling stasis of the bigger picture – a musical ‘screen’ – is explored in the Prestothat follows, in which the accordion plays quavers out-of-sync with each other before ending the movement by splitting itself open in contrary motion. Movements 6–9 are played on top of one another in another gesture reminiscent of Gudmundsen-Holmgreen’s merry pranks: we feel the Sereno movement trying to haul the others – misterioso, danzante and agitato– up from the depths but there are too many competing voices for any to gain the upper hand, not even the piano’s which ascends slowly but surely. We hear a fantasy or ‘dreamed’ dance in Molto dolce e sereno. The droops which see that movement off come to characterize the next, Cantabile, in which fairytale brass fanfares try to set a scene but all slips away before anything tangible can be established (we appear to be in the dream world of Bent Sørensen). With the frantic Senza problem finale, the soloist is apparently forced into a dance conjured up by multiple instrumental factions (now including saxophones), again dragging one foot behind the other. The music is not quite ‘problem free’, as the soloist falls down exhausted at the end. There is a grand process of gradual coalescence and ultimate dissolution at work in Hvidtfelt Nielsen’s Symphony No. 3. In a mirror image of the composer’s first symphony The Sense of a Fall (1997–98, derived from Flowerfall), this single-movement symphony sets in motion a cumulative journey upwards from low to high: a symphonic Tower of Babel reaching for the heavens. After another musical Big Bang, stuttering fragments muster to initiate the development of the symphony’s vertical structure, supported by foundations in the form of tectonic pedal notes. We are made aware of a ‘micro’ weave in the middle of the orchestra pushing the growth onwards; a broader ‘macro’ weave exists lower down (and perhaps higher up) but proves somehow imperceptible in the moment. The resulting feeling is of a river flowing – the symphonic river of Per Nørgård or Jean Sibelius, perhaps – but flowing uphill, with focused determination. There is little doubt that it will reach its goal. The composer describes the symphony as ‘watching life’, and talks of ‘many different persons set in motion … connected only by their appearance in the same period of time.’ We hear that in the score’s contrasting velocities but also in its handling of colour: splashed here, set in opposition there. These pockets of unconnected activity will eventually coalesce towards a single focal point when the symphony has reached such an altitude that it can do nothing but evaporate.